"Vavau" redirects here. For the village in Samoa, see Vavau, Samoa. 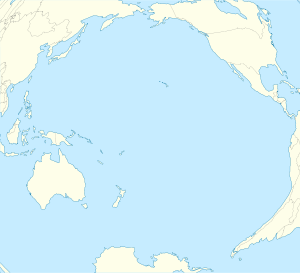 Vavaʻu is the island group of one large island (ʻUtu Vavaʻu) and 40 smaller ones in Tonga. It is part of Vavaʻu District which includes several other individual islands. According to tradition the Maui god fished up both Tongatapu and Vavaʻu but put a little more effort into the former. Vavaʻu rises 204 metres (669 ft) above sea level at Mount Talau. The capital is Neiafu, which is the fifth largest city in Tonga, situated at the Port of Refuge (Puatalefusi or Lolo-ʻa-Halaevalu). Tongan (majority), European, Chinese, Pacific Islanders. In Polynesia it is explained that the islands were created by the god Maui, who caught the bottom of the sea with his magic hook, fished up and left on the sea surface what became the islands of Vavaʻu. Don Francisco Mourelle de la Rúa, commanding Spanish frigate Princesa was the first European to come to Vavaʻu, on 4 March 1781. He charted Vavaʻu as Martín de Mayorga who was the Viceroy of New Spain at the time. Captain James Cook knew about the islands a decade before, but the people in Haʻapai told him it would be no good for him to go there as there was no harbour. Apparently they did not want him to go there, and Cook heeded their advice anyway. But Mourelle found excellent anchoring, of which he was in desperate need after having failed on Fonualei (Bitterness island) and Late, and he gave the spot the name Port of Refuge. But his original Port of Refuge was the bay on the west coast of the main island, near Longomapu. In 1793 Alessandro Malaspina visited for a month, following up on Mourelle and claiming the islands for Spain. Tuʻi Tonga George Tupou I instituted the Vavaʻu Code in Vavaʻu in 1839. The Vavaʻu group measures about 21 km from east to west and 25 km from north to south. Vavaʻu had 14,922 inhabitants at the 2001 census, of which 4,051 lives in the capital Neiafu. The islands in Vavaʻu District outside of Vavaʻu Group are uninhabited. The main island of ’Utu Vava’u is 97 square kilometres (37 sq mi), the second largest island in Tonga. Vavaʻu is a coral reef with superior oblique in the north up to 200 metres (660 ft) high cliffs. On the south side of the island group, it is dissolved into many small islands and waterways. The largest of these waterways, the fjord-like Ava Pulepulekai channel extends 11 kilometres (6.8 mi) inland from the harbor of Neiafu, the capital. ’Utu Vava’u island is a raised platform of coral cliffs on the north coast and a low and irregular coastline south that opens in a complex network of channels, bays and islands forming one of the best protected natural harbors in the Pacific. ’Utu Vava’u is also home to the ʻEneʻio Botanical Garden, Tonga's only botanical garden. Vavaʻu has a much warmer climate than the rest of Tonga except the Niuas, a group of islands furthest to the north. Because of the island's warm climate and fertile soil, Vavaʻu is a haven for vanilla and pineapple growers as well as other tropical fruits. Hon. Fulivai – The Noble Fulivai was appointed as Governor of Vavaʻu in July 2011. Hon. Sione Laumanuʻuli Luani was Governor until he died suddenly on 12 May 2010. Hon. Samisoni Fonomanu Tu'i'afitu was appointed Acting Governor of Vavaʻu in 1988 and then Governor of Vavaʻu in 1991. He died on 4 October 2005. HRH Fatafehi Tuʻipelehake was Governor from 1952 until 1965. Hon. ʻAkauʻola Siosateki Tonga Veikune Faletau was Governor from 1936 until 1939 before becoming Minister of Police from 1939 until 1952. HRH Viliami Tungī Mailefihi was Governor from 1912 until 1918. Due to its scenic beauty Vavaʻu is particularly popular with sailors and other tourists and is one of the most important tourism sites in Tonga. From May to October, the Port of ’Utu Vava’u welcomes sailing boats from all over the world to dive with birthing humpback whales and explore underwater caves. The island is served by Vavaʻu International Airport. Tourism, agriculture and fishing are the main sources of income of the population. The vanilla grown here is considered one of the best in the world. Moreover, even giant clams and pearls are cultured. ^ Landin Carrasco, Amancio Mourelle de la Rúa, explorador del Pacífico Madrid, 1971, p.79. ^ "Table G3: Population growth by division, district and village (2006-2011)". Tonga Department of Statistics. Retrieved 21 February 2016. Wikivoyage has a travel guide for Vavaʻu. Wikimedia Commons has media related to Vavaʻu.